Cheers to a sustainable promotion! 1 colour(s) to choose from! Click one of the colour choices from the list. Once you're done, scroll down to select the item quantity. Enter the quantity you'd like, or click and drag our orange 'i'. Where on the item should we print your design? Check the box or boxes next to the imprint location(s) you would like, then click on the colour tiles to select the colour(s) closest to your imprint colour. Once you're done, click the Add To Cart button to continue. What imprint colour(s) would you like? A fantastic way to carry their cuppa - and your logo! Natural coloured, 350ml single-walled take-away style thermal mug made from 50% bamboo and 50% PP plastic. Boost your green credentials with half the amount of plastic than a traditional take-away mug! 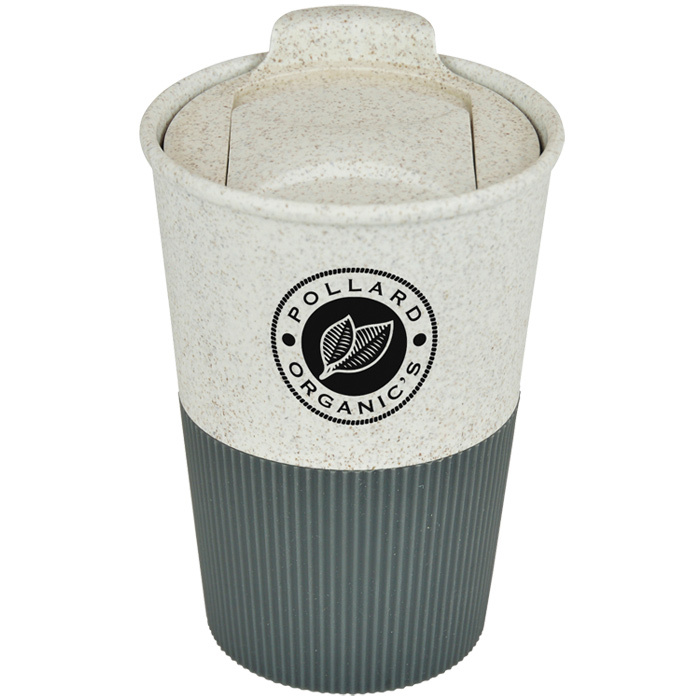 Each mug has a push-on lid with a sliding sipper and a rubber feel design to the bottom half for added grip. Please note the lid does not make this product watertight and it is not dishwasher safe. Material: 50% bamboo and 50% PP plastic. Dimensions: 130 x 92mm diameter. Print area: 170 x 35mm. Once your order is placed, please reply to the confirmation e-mail you receive and attach your art file(s) to the e-mail. We gladly accept all file types. Check out our art tips for more information. Visit 4imprint.co.uk or call toll free 0800 055 6196 to order or for questions. It's on time or it's on us. If your event is missed because we didn't dispatch on time, your order is free.